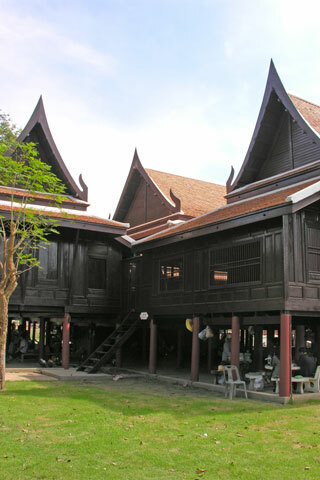 Khun Phaen’s Residence is a traditional Thai house crafted entirely out of golden teak in 1894. It was inspired by the descriptions of a house owned by one of the main characters in Khun Chang Khun Phaen, a famous Thai literary epic that recounts the story of two men’s 50-year fight over a woman. While you won’t find any info about this poetic story, the house certainly harks back to the period when Khun Chang Khun Phaen became one of Siam’s best-loved tales. Glossy polished teak floors meet fretted walls with swing-open windows in four rooms set around a central open area. All of it was constructed on broad teak stilts and fitted together without a single nail or screw. A few antiques and resting dogs can usually be found inside. The house occupies a piece of land that once served as Ayutthaya’s prison. Many prisoners were beheaded here, often after enduring horrific torture. (See Bangkok’s Corrections Museum for the gory details.) It’s perhaps no coincidence that the elegant house was built on the site late in the reign of King Rama V, who abolished torture in Thailand. Khun Phaen’s Residence is located on Pathon Rd, just west of the junction with Si Sanphet Rd, next to the elephant stable and within the Historical Park.